Microsoft has released a cloud version of office called office 365 live or office live and few new features also have been released with office live, where you can access mail, manage documents, and you need only browser to create and edit documents using Excel, PowerPoint, word and Outlook for mail. This will give you total web experience to manage emails, and contact, calendars, and you communication via messaging. Once you registered with office 365 cloud then you will have office admin workspace environment where you can manage settings for outlook for communication messages, lync for instant message and video services, you also can manage team site and documents for your team to work. There will be header inside your office 365 workspace where you will find links for Home, outlook, team site. 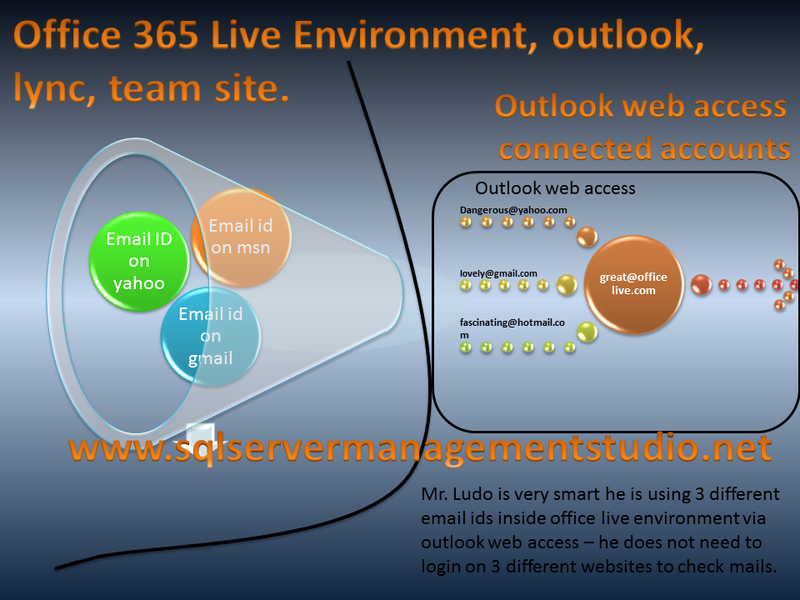 You also can design website inside the office 365 live workspace environment. Whereas Outlook configuration is quite easy and ready to go, you just login and start working and send email and received e-mail via exchange, it’s same User interface like you have in outlook web mail but few new functionalities are bundled inside. You can manage your team site from office admin workspace, you can edit your team site for your team to work, you also can administer your team site from this workspace, there are number of templates available for people to design their team site as per requirement template includes announcement, assets web database, basic workspace, basic search center, blank meeting, blank site, blog, calendar, contact, custom list, document library, form library, project task, Visio process library etc- this is partial list. Inside office 365 login screen you will have main navigation where you can point your location to team site, it’s a sharepoint team site version where you can store docs inside the workspace. By clicking site action menu you can edit main page and its look and feel, just edit your team site on the fly. Another new feature has been added in office live, that is connected account feature which help people to just use single account to check all other emails like yahoo, opened, Msn and Gmail ids can be checked by one click using connected accounts – all these email id can used inside outlook web access Microsoft Office 365 environment and reply using one single environment – you can sync cloud based 5 account and these 5 accounts can be used inside outlook web access and inside your office cloud environment and you can reply using office account. Say what you want to say via comments.